The Rainbow Flowage in Oneida County has dropped 13 feet while Deep Lake in Washburn County isn't so deep anymore - it's down 15 feet. Most stream levels are down to only about one-third of their normal flow. 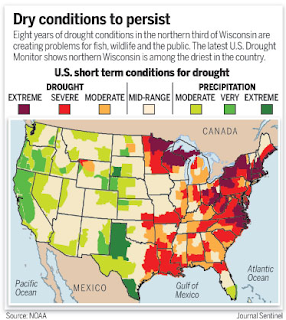 There's not much relief in sight considering the summer outlook from the National Oceanic and Atmospheric Administration Climate Prediction Center is forecasting drought conditions in the North Woods to persist. And even if Wisconsin is deluged with rain for weeks, it will take a long time to recover, said Ed Hopkins, assistant state climatologist. yes,,, oh yes this only confirms what we have been vacationing with for to many years. maybe it is just a cycle that will fill our lake again....soon. I did opt to read more of the article.... guess what? the bass may be eating the walleye babies. it will be surprising if anyone catches a walleye in the near future. While the water is low, and remains low, people should consider c&r for all the apex predators in the lake. Lower water levels limit the ranging potential for the bass, northerns, and walleyes. Keep all the bluegs and panfish as they will overpopulate. The less water, the easier they are to catch.